This past Tuesday saw SSHL celebrating “50-dagars”, a much-loved tradition where the graduating students celebrate that there are only 50 days left until graduation. They also receive their Abiturient-caps 50 days before graduation which traditionally signifies that they are eligible candidates to receive a high school diploma this year. 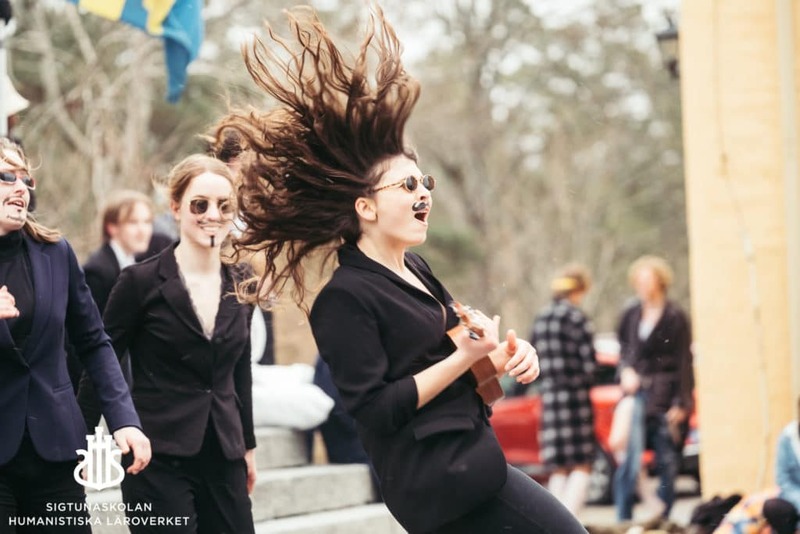 The tradition begins on the steps to Midgåren where the boarding houses each perform a skit or show of some kind often ending in a traditional chant about only having 50 days left until graduation. Afther the shows are over the graduating students all march down to the rose garden at our neighboring sister organization, the Sigtuna Foundation, where they toss a coin in the wishing well. The students then proceed to march through the town of Sigtuna. The march returns to the steps at Midgården where the students receive their Abiturient-caps resulting in smiles all round. While the graduating students were seated for dinner the younger students were treated to hot-dogs while they waited patiently for the big gala event. After dinner younger students, staff and many parents fill the Aula for an exciting gala event where prizes are given out to students in a multitude of categories. One rainy Saturday in the beginning of March, SSHL hosted the Swedish national indoor rowing tournament “Svearodden 2019”. Some 200 participants joined the event which took place in our sports hall, where a large number of rowing machines were lined up for the occasion. The competition was arranged by the Swedish Rowing Federation. As a part of the Swedish Masters series, it attracted rowers of all ages and levels, from all around the country. Rowing machines were brought in by sponsors and other rowing clubs to add on to our own. At SSHL we are proud to be able to share our facilities for an event like this. The school has a long history and tradition of rowing. Our own rowing club, SSRK, is very active at the moment with a significant number of athletes on the rowing team. A total of seven of our SSRK students participated in the rowing tournament. Bedirhan Sezgin is the team captain and for him it all began two years ago when he was looking for a new athletic experience. – Rowing is both competitive and tough, Bedirhan says. Due to the characteristics of rowing, we have been practising both outdoors and indoors depending on the season. Personally, I think indoor rowing is harder than outdoor rowing, he continues. Three SSRK team members focus on the challenge to come; Marc who is one of the oldest members, Bedirhan as the team captain and Connla who is coaching the team. Marc Maasland comes from a family of rowers. Marc hadn’t initially considered joining the team, but when he was invited to join it felt completely natural for him to agree. Despite being several years younger at the time, he matched his teammates physically due to his height. Height gives rowers a power and speed advantage. – During winter, we focus on technique and stamina, Marc explains. But winter training isn’t as fun as being out on the water! You´re just on the machine and in the gym. Being outdoors in nature is much more enjoyable, going somewhere together as a team, cheered on by locals taking a walk by the lake. Othilia Schrøder, SSRK, winner in the category for high school girls. SSHL was the only school represented in this tournament, so the race categories for high school students saw the SSRK team members pitted against each other. Marc Maasland won the high school boys category and Othilia Schrøder won the category for high school girls. Every year SSHL and the other schools in the SIPSI sports exchange programme meet up for the traditional rowing races. SSHL won three of the races last year; single, double and 4-males boat. – More people should come and try rowing! All students are welcome to join our team, Marc says. Marc Maasland, right, winner in the category for high school boys. This Open House is for students and families interested in our high school programmes. Teachers and students as well as our Guidance Counselor will be available to give information and answer questions. Guided tours of campus and some of the school's buildings on request. Our boarding houses Backa and Skoga are open for visits. The event takes place in Instan. See map and picture below. Congratulations to our teacher Helle Olander for winning the municipal teacher of the year award! Representatives from Sigtuna Municipality surprised Helle at yesterday’s pin ceremony with the municipal teacher of the year award. We had multiple teachers nominated this year, and we are equally proud and grateful of all of them for all their hard work! ﻿Vi vill också tacka alla på Sigtuna Kommun som organiserar denna utmärkelse. Carina Nilsson, Principal at SSHL. Get to know SSHL by attending our presentation in Bangkok, arranged for Swedish families in Thailand with the help of our good friends at SWEA. If you cannot attend, individual meetings in Bangkok can also be arranged directly with SSHL’s representatives, for your specific questions. Principal Carina Nilsson is visiting SWEA to talk about SSHL and she is also available to meet interested families. Place: The venue is to be announced. The time will be in late afternoon or evening. Book individual meetings by contacting carina.nilsson@sshl.se. SWEA – Swedish Women’s Educational Association. SWEA is the largest non-profit organisation outside Sweden with the purpose of promoting Swedish language, culture and traditions. The SSHL Parents Association invites you to spring dinner at Sigtunastiftelsen on Saturday 16 March 2019. For more information and to register, please click here or contact Karolina Norlin at karolina.norlin@sshl.se. The SSHL Debate Society is proud to host a debate competition this spring; the SSHL Open 2019. The debate tournament will be held in September and debaters at all levels from across the world are invited to attend and enjoy each others debating skills. We see this as an opportunity for participating teams to interact and engage in critical issues. SSHL Open will be held in accordance with the World School Debate Format. And this weekend will not only include debates — lectures, skill workshops and evening activities are all a part of the programme! Do you want to register for SSHL Open 2019? You are most welcome to register your debating team for SSHL Open this fall! Please fill in the form here: sshldebatesociety.weebly.com/registration On this page, you also find more information about the competition weekend. Trinn Toimetaja, was the President of the University of Tartu Debate club from 2016 to 2018. Also, she was the DCA of English College Open 2018 and the CA of FINDA Schools Cup 2018. Milla Huuskonen, who is a highly experienced debater and judge. Her university debating speaker achievements include breaking at the European Universities Debating Championships twice and making the top 10 ESL speakers of Euros in 2018. We are looking forward to many national and international teams joining us and a weekend filled with fantastic debates! Guest Lecturer at today’s Assembly: Peter Wallenberg Jr.
Peter Poker Wallenberg as guest speaker at SSHL during today´s assembly. At SSHL there are plenty of traditional graduation activities for students, families and staff. The following is a recap of some of the events in a letter sent out to families earlier this school-year. Start: 16.00. “50-dagars” is a much-loved tradition where the graduating students celebrate that there are only 50 days left until graduation. The tradition begins on the steps to Midgåren where the boarding houses each perform a skit or show of some kind. 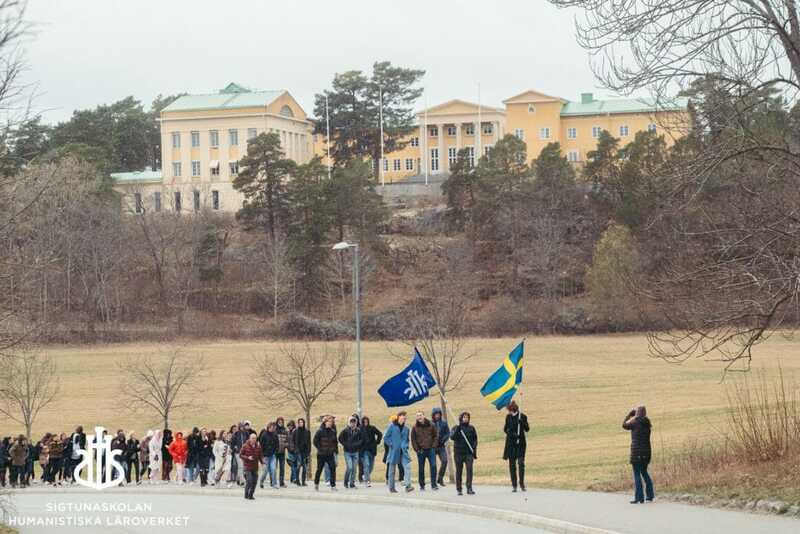 The students then proceed to march off campus and through the town of Sigtuna. Students receive their Matriculation cap when they return to school. The dinner starts at 19.00 for students and specially invited guests, continued by the Arcu gala. Read more about this tradition and see some of last years celebration here. Dinner for students and specially invited guests (seating in mentor groups). The evening starts at 18.00 with a performance by the students, followed by dinner where the students give their speech to the mentors. The students gather by the Aula at 13.45 and march into the Aula where parents, family and year 2-pupils are waiting. The programme starts at 14.00 with speeches and music performances followed by the student awards. No planned activities at the school follows afterwards. 08.30 – 09.15 Breakfast for boarding students in the boarding houses. The exam witnesses and teachers with lessons eat breakfast in the dining hall. 09.20 The students meet the exam witnesses and teachers in Instan/Gradängsalen. 09.45 – 11.10 Lessons according to a special schedule in the presence of exam witnesses and school management. 11.15 Scrutinium in the Aula for students, exam witnesses and teachers. The exam witnesses give their assessment and the students say goodbye to their teachers. 11.30 – 12.00 Assembly at Midgårdstrappan for the families, relatives and friends. The Matriculation cap is exchanged to the Graduation cap in Midgården. 12.00 The student graduation on Midgårdstrappan. Photographing and there after the student meet their families. 12.20 The students assemble on the wall opposite Midgårdstrappan to sing. 12.45 The brass band leads the students back through Sigtuna. 13.00 – 14.00 Lunch for exam witnesses and teachers in the dining hall. 13.30 The students return from their march to Sigtuna. 13.30 External students have their own receptions. 18.00 Departure to Valedictory ball. 02.00 Return from the ball with buses to Sigtuna and Stockholm. Discover the SSHL campus, meet students & staff and get a feel for what SSHL is all about. Learn about boarding school life, our academic programmes, the student organisations, see the campus and facilities. Who is open house for? Open house is open to all families interested in our middle years programme and high school programmes. Meeting point and all information is given in “Instan”, the white building (see image and map below). All day Guided tours all day long. The student organisations Kenya project and Life-Link presents its organisations. Instan: Meeting point and all information is given in “Instan”, the white building.